THE HOTTEST NEW NIGHTCLUB / RESTAURANT PRODUCT: As Seen For The Very First Time At Gentlemen's Club EXPO 2007! It's A Full Function Table... It's A Menu... It's A Billboard... It's A Movie Theater! Excellent Sales and Promotional Tool that Won't Wear Out - Change The Messages as often as you like in a variety of cost effective manners. Perfect for Menus, Specials, Posters, Flyers, Announcements in a static full color graphic image or a complete personal commercial in FULL MOTION VIDEO. You can even broadcast TV programming on these amazing table surfaces! REPLACES Tents That Take up Table Space - Save $ On Damaged Literature - Your Material Is Fully Protected. Circular / Square / Rectangular Shapes in a Variety of Sizes and Colors are available for IMMEDIATE delivery! Our most economical version with impact that is only limited by your imagination. 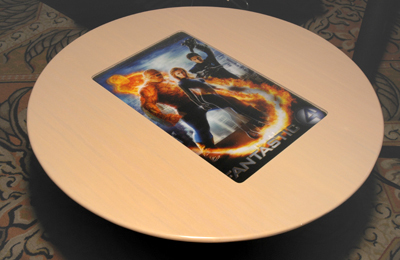 The High-Tech Table displays printed material of your choice from your existing menus, flyers or custom pieces. There is no longer the need to offset print high quantities of promotional material. Graphic flyers can easily be produced from the computer and laser printed in the quantities needed to be inserted into each table top. 3-D Holograms are also available! Literature is totally protected from damage and can be changed at will in a snap! Your tables now become a POWERFUL communication tool! All the features of High-Tech with ILLUMINATION! These table tops display your message in striking backlighting for added impact. Economical color transparencies are easily created from your graphics and inserted into our special backlight that is self contained under the table. Duratrans transparencies can be produced practically anywhere from your graphic files - you have complete control over your message and ability to economically change as often as necessary. No need to order with delivery delays or high quantity requirements. The ULTIMATE Table Top communication tool can display full motion video from simple Powerpoint presentations to your own video files - even television programming! An amzingly THIN LCD monitor is mounted under the table and protected by a tough lexan surface that is completely FLAT. The possibilities are endless with this magnificent combined Table and Movie Theater!